Reissue releases usually oversell the now-clichéd story of a misunderstood musical genius. 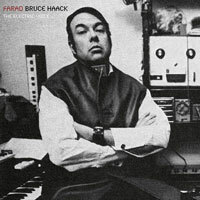 Farad, Stones Throw’s retrospective of electronic music eccentric Bruce Haack, does peddle that tale to a certain degree, much like the 2004 documentary Haack: The King of Techno. But the real pleasure of the disc, covering music released during the later part of his career from 1970-82, is that it doesn’t try too hard to define Haack’s compositions and philosophy or spend extensive time wondering, “What if?” It instead exposes the raw components of his odd career, an improbable, colorful circuit board resembling the wiring to some Rube Goldberg device. A musical prodigy from a Canadian mining town, Haack was all-encompassing in his approach. He had composed far-out children’s music and pop songs, experimented with classical/synthesizer hybrids, and hand-crafted a studio’s worth of electronic instruments (including a proto-vocoder, Farad, named after inventor Michael Faraday) by the end of the ’60s. Few can claim to have demoed electronic instruments for Fred Rogers and written a song covered by Beck (“Funky Little Song”, not included on this album). But his scattered biography goes a long way toward explaining the playful weirdness and the philosophical underpinnings that made Haack so refreshing. Even on his psychedelic excursions or the stone cold electro funk of “Stand Up Lazarus,” there’s a sense of wonder and play, and he doesn’t stay perpetually plugged-in, letting folk and country twang find its way into his music. The tone of his tracks veered from suspended, bubbly escapes (“Rain of Earth”) and silly sing-alongs (“Maybe This Song”) to a Kraftwerk-worthy electro jam with a pre-Def Jam Russell Simmons (1982’s “Party Machine”) or the Byrds-like tinge of “National Anthem to the Moon,” one of a handful of tracks on the comp taken from his 1970 album The Electric Lucifer. Haack took to the vocoder like Jim Henson took to felt, imitating a guttural monster on “Noon Day Sun” and bending his voice into that of a cheesy lovelorn cyborg on “Rita”. On the jaunty, “Electric to Me Turn,” Haack gets philosophical over steam organ synths, declaring, “Electric to me turn this night/ Reflecting universal light/ All I knew that should be true/ Is reality in you.” Hindsight may render some of these tracks a bit silly or indulgent, but this patchwork of music showcases a true believer and a talent that deserves recognition among his early synthesizer peers.